You’ve built your landing page, but you’re far from finished: now it’s time for A/B testing (split testing)! A/B testing will help you fine-tune your campaign by distilling exactly what it is that drives your audience to take action. 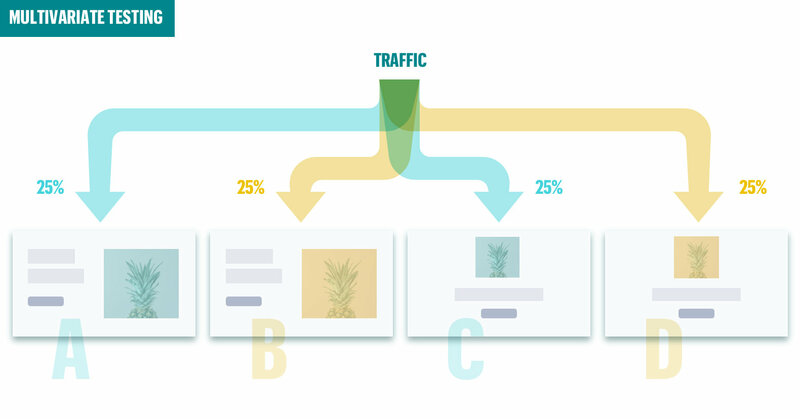 By identifying which elements influence conversion rates, a/b testing is one of the best ways to improve the effectiveness of your campaigns and make it easier to repeat what works and scrap what doesn’t. From images and copy to landing page design – everybody has unique preferences and A/B testing is how you learn what works for your target audience. AB testing landing page basics, what to test on your landing page, walk you through some of what the Leadpages marketing team has discovered over the years and give you step-by-step instructions for setting up your own A/B Landing page test right inside the Leadpages landing page software. Remember that American TV show phenomenon: the newlywed game? The host takes a newly married couple and separately asks the husband and the wife the same set of questions in order to reveal how well the couple truly knows each other. In a similar vein, A/B testing is a super-simple marketing tactic that tries to expose the preferences and behavioral patterns of your target audience. The better you know them, the better you’ll perform in this digital marketing game show. So, how well do you know your target audience? Do they respond better to long-form or short-form landing pages? Do they tend to watch videos on the page or scroll right by them? Which colors seem to resonate with this group? Do they respond best to a certain style of imagery more than another? If any (or all) of those questions left you feeling like: hmmm, I really have no idea – then, fear not. You are in the right place. 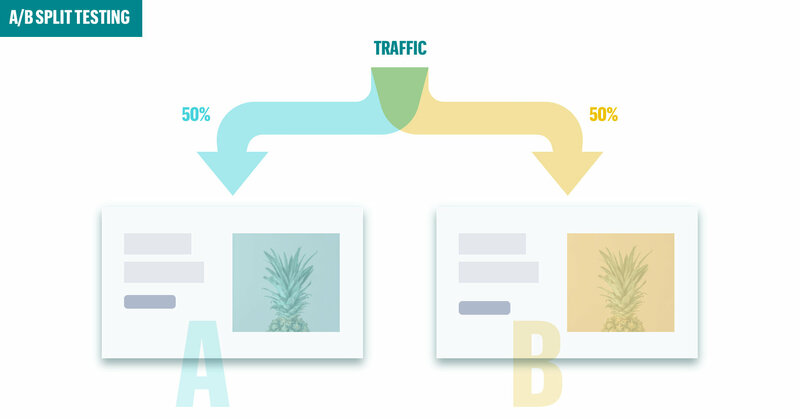 Wondering why you should bother with A/B testing? Check out our ConversionCast roundtable discussion that dove into the topic of when you should a/b test and when you shouldn’t. Our own survey data from more than 10,000 self-identified marketers revealed that 44.4% of them do some sort of A/B testing either weekly, monthly, or occasionally. Comparing two different versions (A and B) of a landing page or webpage to see which performs better and evenly splitting the traffic between them. The one with the higher conversion rate wins! Ideally, A/B tests would isolate one variable at a time (such as headline, button color, background image, etc.). AB testing your landing page or webpage will evenly split traffic between two different versions of the page, in which only one variable is modified. Similar to an A/B test, but compares multiple variables at once. Test all your assumptions and assume nothing. Your tests are (very) likely to surprise you. Maybe you thought that big purple button would be a big winner, or that a cat .gif would delight your audience – but you don’t know until you test. Every day, our customers demonstrate just how critical A/B testing is to their businesses and that they really can result in dramatic increases in conversion rates (sometimes as high as 300% or more). Whether you’re collecting leads or credit cards, a better-converting page always leads to revenue growth in the long run. In order for your A/B test to be valid, you’ll need to focus on changing one single thing at a time. If you’re launching a lead generation campaign that won’t run evergreen, you may want to focus your energy on building two versions of a similar landing page and pitting the two against each other. Drive some traffic to both and uncover which one out-performed the other. Then, simply switch off your A/B test and only run with the winning version. Ok, so you’re onboard now: A/B testing is the easiest way to make sure your lead generation campaign is leak-proof. If you’re wondering how to optimize your landing page, the question is: where do you begin and what do you test first? Likely your landing page will contain a headline, call to action, graphics/ images, and sales copy. These are excellent places to begin. Your first statement is sometimes make it or break it. Try different lengths, phrasing, or evocative approaches. For example: “Learn the Success Strategies that will Propel Your Music Career Forward” vs. “Grab this eBook While You Still Can!”Writing headlines can be hard because you often have a few competing goals. You want to be compelling so that people respond to your call to action. You want to be informative so that people fully understand the value of what you’re offering. Test drive a totally different landing page template to see if your audience loves one more than the other (keep all other variables constant). Choose two different stylistic approaches such as screenshot vs. stock photo, stock photo vs. original photography or illustration. A call-to-action button isn’t just a little rectangle full of words. It’s “your virtual salesperson.” Pay close attention to how your call-to-action buttons appear. Does your audience love cutesy creativity or plain, direct language? If your CTA is lackluster or hard to find, your conversion rate will suffer. Text-laden pages might scare some people away, try breaking up blocks of paragraphs into bite-sized chunks. Split test after split test shows that quantifying what you’re offering site visitors improves your conversion rate—and the more specific your numbers are, the better. Numbers are powerful. Pricing experts have realized this for decades: in the minds of consumers, $4.99 is a lot cheaper than $5, and, on restaurant menus, the dish listed as “bruschetta: $5” is more expensive than the one that appears as “bruschetta: 5.” Try to vary how you format your numbers and which digits you display. Your landing page copy and writing style matter. Try drafting two different versions of your body copy, primary sales pitch, or value proposition. Emphasize different features or benefits in each and see what messaging resonates. Credentials, testimonials, and endorsements could potentially increase the perceived value of your product or service. On the other hand, they could also add friction to your landing page, making it busier and distracting from your call to action. When is your audience most available for an online webinar? Find out by offering two different time slots AM vs. PM. Interested in webinars for lead generation? Learn more about the Leadpages Webinar Marketing System. Over the years, the Leadpages marketing team has become master of A/B split testing. We’ve lead hundreds of split tests on our own landing pages and supported hundreds of thousands to take place across our customers’ pages. We’ve often noticed that opt-in rates rise when you put an image of the product you’re offering in your Leadbox. One Leadpages customer (Jae Jun at OldSchoolValue.com) mocked up two versions of a software box & CD for his stock-analysis software. The more modern of the two received 99.79% probability of outperforming the more traditional-looking package. By removing the “first name” form field from, you can reduce visual clutter within the LeadBox or opt-in form. Why? It’s simply easier for visitors to opt-in when less information is required. While fewer form fields are better for conversion in many cases, keep in mind that your own audience may vary. Award-winning author Amanda Stevens changed her ran a headline A/B test on her eBook landing page that yielded shocking results. Her headline went from “New Book Reveals Rescue Remedies for Retailers” to “If you’re a retailer in a need of fresh ideas and proven growth strategies, this book is for you!” and her conversion rate skyrocketed. Short form squeeze landing pages rely heavily on a background image and little to no text next to an email opt-in form. Leadpages customer Evelyn van der Harst swapped out a background image and took her response rate from 24.97% up to 34.85% (that’s a +39.5% increase in conversions!). Leadpages customer, The Foundation, discovered that simply deleting the call to action headline on their video squeeze page boosted their conversions by 28%. To run this test, the Foundation used a video landing page template, copied the page and deleted one of the headlines to create the variation. Even more surprising: the Foundation team also ran this same test on their homepage. In both cases, the “no headline” variation won out by a significant margin. Weird, huh? A big thanks to all the Leadpages customers and small business marketers who have given us permission over the years to publish the results of their landing page A/B tests and split tests. Review & launch your test! Unfortunately, A/B testing is not an overnight project. You have to put some thought into what variables drive conversions, construct multiple variations of your landing page or pop up, let the test run for a period long enough to collect meaningful traffic data, and (most importantly) circle back around to figure out what you learned and what you should change in the future. It’s really relative to the campaign you’re running and how much traffic you’re able to drive to the landing page during the testing period. If it’s an ongoing, evergreen campaign, we recommend that you run an A/B test for at least two weeks to properly collect results. However, if your campaign will be running for less than two weeks, you may be able to get results in just a few days. Keep in mind: not all traffic behaves the same way. Cold traffic (strangers to your business) will likely act very differently than warm leads who have interacted with you for months online. In order for your A/B test to be statistically valid, you’ve got to make sure your audience is staying consistent across the two web pages you’re testing. Otherwise, you risk drawing the wrong conclusion. Before you go, keep in mind that not every split test you find on the Leadpages blog or elsewhere on the web will work the exact same way in your business. In fact, the odds are about 50/50 that your audience will — surprise! — do the exact opposite. So why even look at case studies of A/B split tests? Why bother split-testing at all? It’s simple. The fact is: You have no idea what will work for your individual audience until you start testing. The more tests you run, the more you build up competitive intelligence about your own business and your customers. What’s your favorite A/B test strategy for landing pages? Have you discovered anything unexpected about your target audience and their preferences? Tell us in the comments section below!